It’s got all the thick, gooey texture of cookie dough. All the wonderful chocolate flecks of cookie dough. And if you squint a bit, it kind of looks like cookie dough, too. But it’s not cookie dough. 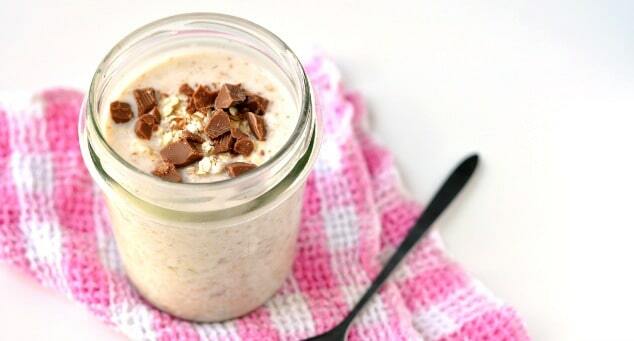 It’s healthy chocolate chip cookie dough overnight oats! The more nutritious and slightly more grown-up version to eating raw cookie dough straight from the bowl. You know those mornings when you could just eat raw cookie dough straight from the bowl for breakfast? Maybe you didn’t sleep properly. Maybe you’ve got a horrible day ahead. Or maybe it’s just Monday and you’re not ready for it yet. Whatever the reason, instead of risking salmonella, whip up a jar of these healthy chocolate chip cookie dough overnight oats instead. Your sweet tooth will be satisfied and you’ll still be able to fit into your skinny jeans! For as long as I can remember, I’ve always thought that the batter tastes way better than the baked good. Which probably explains why I’ve got a thing for cookie dough and have turned it into an Egg-Free Cookie Dough Dip, Chocolate Chip Cookie Dough Oatmeal and Chocolate Chip Cookie Dough Baked Oatmeal. Chocolate Chip Cookie Dough Oatmeal is one of my all-time favorite breakfast recipes. But as the temperatures creep up ever so slowly and we move into spring, I lean toward chilled overnight oats instead of the piping hot kind. Thus we have chocolate chip cookie dough overnight oats! Year ago I remember reading on Something Swanky that overnight oats are better for you than stove-top or oven-baked oats because they’re raw. Uncooked oats help you lower or maintain a low cholesterol level way better than cooked oats. So if your friends or family ever tell you to grow up and not eat cookie dough for breakfast, tell them you have to for good health. And caring about your health is incredibly responsible and grown up. So there. You don’t have to scoop this single-serving breakfast treat into a cute glass jar like I did. But overnight oats in a jar are so much prettier than overnight oats in a bowl or plastic container. I didn’t go out and buy special jars to put my oats in. I always use leftover jam jars. They’re the perfect size and shape for overnight oats! But if you do want to buy special jars to make your overnight oats even cuter, I recommend you buy these adorable jars. They’ve got colourful resealable lids and they’re each the right size for one portion of overnight oats. This cookie dough overnight oats recipe is definitely one for people with a serious sweet tooth. As in people who could actually devour a bowl of real cookie dough for breakfast at 7am. And that would be me. If you’re more of a savoury breakfast person, you might want to sit this recipe out and go for these Broccoli Hash Brown Cheese Cups or Monte Cristo Hash Brown Egg Cups instead. Place all the ingredients into a medium-size bowl and stir well. Pour into a single-serving jar and store in the fridge overnight, or for at least 4 hours, before eating. Yum! Cookie dough oats. I think I could sell that as breakfast to my toddler and husband. Yum! I have a strong sweet tooth so this would be perfect! Such a great way to start the day and I love your tip about using leftover jam jars. Great recipe to have for those evil chocolate cravings when trying to stay on the “wagon”. On my list! Cookie Dough Overnight Oats???? Genius! Nice to have something that satisfies the sweet taste buds without being too unhealthy. If I could send you over a jar right now I totally would! I love the idea of a sweet breakfast & cookie dough is my favorite thing ever so I’m very excited to try this! The only question I have is what kind of oats did you use? I don’t wanna use the wrong kind and it not turn out as good! Hi Brielle. Thanks so much for stopping by! If you like cookie dough then you really will love these overnight oats! I use rolled oats for all my overnight oat recipes, including this one. I hope you love this breakfast as much as I do! Thanks so much, Swayam! I’ve never tried blueberries in overnight oats before. Everyone keeps going on about them – I really must try them! What a great idea for a filling and delicious breakfast! This sounds really delicious, and it’s making me wish I had one right now! I’ll have to make it for breakfast tomorrow! What a good idea! Why didn’t I think of this! Looks delicious! A healthy chocolate chip cookie dough recipe?! Is this real life? I bet even my husband would eat these in the morning! Thanks so much, Rae! Take a bite and you won’t believe it’s a healthy breakfast recipe!! I love overnight oats, as they make such an easy breakfast so I am always looking for more ideas. Yum. What a brilliant idea for overnight oats – these will certainly satisfy any sweet cravings you may have without forfeiting on the healthy aspect. Yum! You’re right, Dawn. 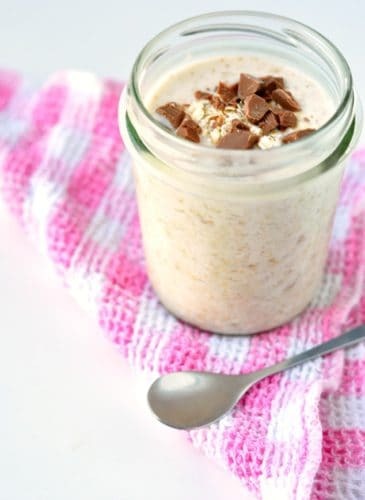 These overnight oats make an awesome afternoon snack, too! I love kicking the day off with something sweet and healthy, too, Patty! I bet this will be his new favourite breakfast, Laura!